I only found out about baby wetsuits from other Mum's at my baby swimming lesson. This one is easy to put on and take off and looks good too, would definitely recommend to keep baby more comfortable in normal temperature pools. Trips to the pool are a lot nicer for both of us with one of these. Doesn't seem to mind the chilly water anymore. From my point of view it is so easy to put on and I feel more secure holding my baby in this. If only all baby clothes were this easy to put on! Lovely colour schemes as well. Excellent product but know your pool. Great if you know your pool is cold. Have been in warmer pools were this was too much. Revolutionary new Baby Wetsuit from the UK! 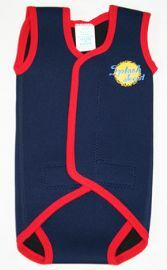 The Splash About baby wetsuit keeps babies warm in the water and prevents the changing room chills. It gives solidity to the body, makes the baby easier to grip, protects barrier cream for those who require it and acts as a total sun block. The unique Splash About design opens completely flat for ease of dressing and adjustment so that you can enjoy an easy changing room experience. This Babywrap baby wetsuit acts in the same way as a conventional wetsuit by wrapping a layer of comforting warmth around your baby. 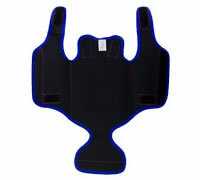 Made from soft and supple neoprene (the material used for wetsuits) with a tough layer of nylon either side. 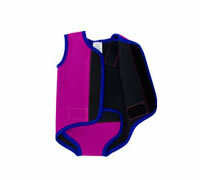 This allows you to ensure the baby wetsuit fits your child perfectly, as well as allowing for some room for growth. Most baby swimming classes start when your baby is about 4 months old, while they can still remember the safe, warm security of the womb and are not naturally frightened of the water. Keeping your baby warm in water will help nurture and safeguard these memories and prevent them being replaced with a fear of water due to feeling cold. Splash About Babywrap baby wetsuits are excellent when swimming in the ocean or taking your baby to cooler swimming pools. 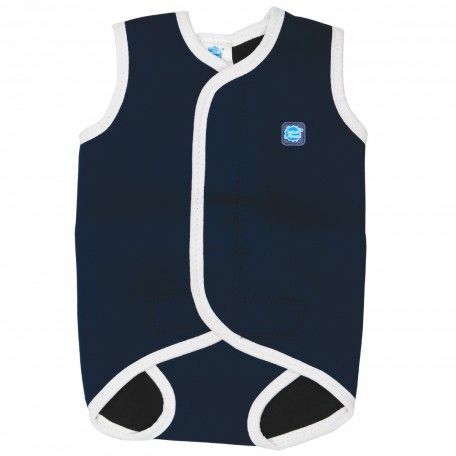 The Babywrap baby swimming wetsuit is made from soft pliable neoprene it is secured with Velcro for a perfect fit every time. Revolutionary new Babywrap baby and toddler wetsuits by Splash About. Keeps babies warm in the water and prevents the changing room chills. Opens completely flat for ease of dressing and adjustment. 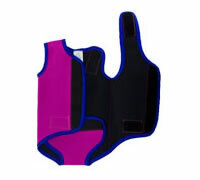 Made from soft and supple neoprene with a tough layer of nylon either side. 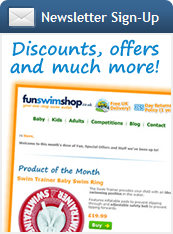 Designed with swim teachers, parents and babies in mind. Splash About Babywrap baby wetsuits are excellent for the ocean or swimming pools.